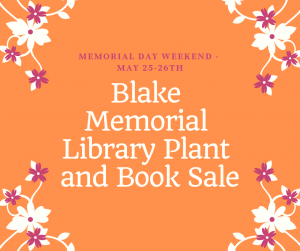 Another fantastic Plant & Book Sale is set for Memorial Day weekend. Browse through a sorted collection of thousands of books and many varieties of plants. The sale will take place Saturday, May 25 (8am-2pm) and Sunday, May 27 (9am-1pm). As always, the library depends on community support to make this fundraiser a success: we’ll be accepting book donations from April 1st to May 14th during library open hours only. * Sorry, we cannot accept textbooks, encyclopedias, magazines, journals, items with mold/mildew, or VHS/cassette tapes. * Please drop off your donations during library open hours ONLY. Donations can be left next to the photocopy machine; please do not leave donations on ramp or front library vestibule. Open hours: M, W, F 2-6pm, TH & SA 9am-noon. Plant donations will be accepted in the few days leading up to the sale and can be left behind the library, near the ramp. Please label your plants! Popsicle sticks and pens will be on the ramp for that purpose. Thank you! 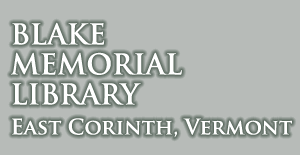 The library depends on your generous donations for the success of this important library fundraiser, so thank you ahead of time for your support!